Dolpo is culturally and geographically similar to Tibet, as locals still practice ancient Bon religion that predates Buddhism. A visit to 11th-century Sandul Gompa is a major highlight of this trek and so is Thashung Gompa located near Phoksumdo Lake. 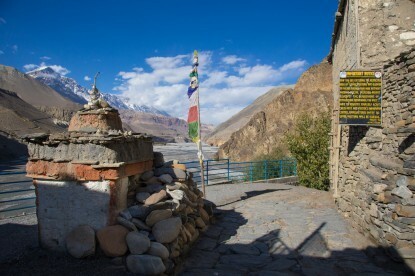 Dolpo, divided into Lower and Upper Dolpo, is a remote trekking region that lies in the trans-Himalayan landscape bounded by the mighty Himalayas and Tibet on the north. Lower Dolpo Trek offers a short adventurous journey into this mysterious, wild landscape which includes a visit to Phoksumdo Lake at an altitude of 3611m. The trekking trail here was actually carved out by yak caravans that for centuries transported commodities back and forth between Tibet and Nepal. Yak caravans in Dolpo walking past beautiful Chhortens erected on the backdrop of barley fields still make for a sumptuous sight. Ringmo, Dho Tarap, Dajok Tang are some typical Tibetan villages where you get to interact with locals and learn their ancient lifestyles. Dolpo is culturally and geographically similar to Tibet, as locals still practice ancient Bon religion that predates Buddhism. A visit to Sandul Gompa is a major highlight of this trek and so is Thashung Gompa located near Phoksumdo Lake. The turquoise lake is a Ramsar site and falls within the territory of Shey Phoksundo National Park which consists of a host of flora such as rhododendron, juniper, birch, pine, spruce, hemlock, and cedar. The park is prime habitat for Snow Leopard, Tibetan sheep, Leopard, Black Bear, wood snipe, crimson-eared rosefinch. The trail crosses through two high Himalayan passes, Numa La pass (5,190m) and Baga La pass (5,070mt) before leading to the lake. The passes offer striking views of Mt. 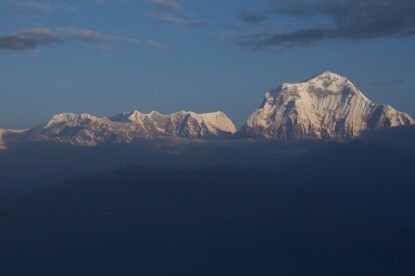 Dhaulagiri (8,172m) and Mt. Kanjiroba (6883m). 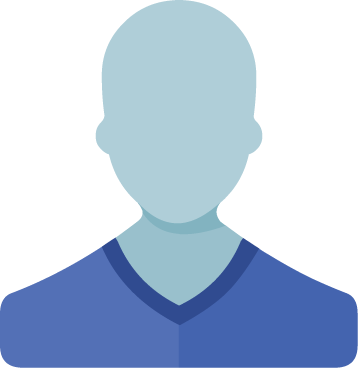 Upon your arrival at Tribhuwan International Airport (TIA), you will be met by our Airport Representative, and transfer to the hotel. There will be a brief pre-trip group discussion followed by a welcome dinner in the evening. We transfer to the domestic airport for one and a half hour scenic flight to Nepalgunj, a tropical zone of Nepal. Here, we have a look around the town lying with the Indian border. We take a morning flight to Jumla. We then commence our trek toward Gothi Chaur where we stay. We will cross the Tila Khola and the Chaudabise Khola, several villages. forest of maple and walnut with wildflowers. Beyond the meadow, the trail climbs to a small pass before descending again to Gothi Chaur. Our trail follows the Tila Khola through the cultivated land of corn, potato, buckwheat, and barley until the valley narrows and then we will be entering a forest. We will be passing through the village of Chotra dotted with typical Tibetan mani walls. After a short distance, we will arrive at another village, Naphukana with a large gompa. From Naphukana the trail goes gradually up through a forest to Mauri Lagna pass [3820m] from where an excellent view of snowy peaks to the north and east are seen. Descending from the pass, the trail passes through a slope before dropping into a forest of pine and oaks. We then enter the Bheri Valley and will come to the village of Chaurikot. The trail goes to Balasa village from where we will be able to see Kagmara peak. The trail descends to a stream via jungle. Passing through the apple orchards of Jyakot, we will then descend to the village of Rimi before following a rocky trail down to the Bheri Riverside. 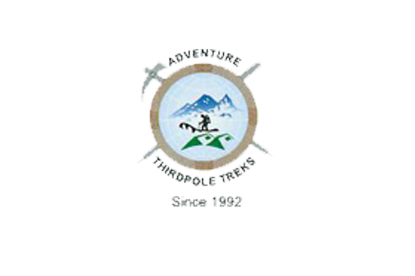 The trail proceeds along the west bank of the Bheri River, passing Hurikot and arrives at the entrance of the Shey Phoksumdo National Park. We will then come to the meeting point of the Garpung and Jagdula Khola. Following the Garpung Khola, we will reach the riverside. We carry on following alongside the Garpung Khola, ascending gradually towards the Kagmara La. It will be a short trek for it is mainly done so for acclimatization. We will be passing through the eastern side of the river, where the valley narrows and the river becomes a series of waterfalls. Walking up to a moraine below the Kagmara La and we will fix our camp amidst the boulders. Wonderful view of the surrounding peaks will be at our doorstep. We will start our journey early today and ascend at the side of the Kagmara Glacier to the Kagmara La. After a 900meter's descent, we will reach the meadow of the Pungmo Khola. The trail enters birch and juniper forest which gives way to blue pine. As the trail contours the side valleys, one can enjoy the brilliant view of Kanjirolba peak then continue the journey to Pungmo village located around barley fields. We walk downhill to the national park headquarters in Sumduwa before joining the trail up the Phoksundo Khola to Phoksundo Lake. We will walk up through a forest to the winter settlement of Palam and continue ascending through the open country to a ridge from which there is a good view of the lake. In the meantime, we'll have a great view of the impressive waterfall- the highest waterfall in Nepal. The trail then makes climbing gently to Ringmo village after an initial descent then after crossing a bridge below Ringmo, the trail continues northwards to the shores of Phoksumdo Lake. Today will be a rest day for acclimatization. In the background of the lake on the western side, there is a huge snowy peak known as MT Kanjirolba or Kanchen Ruwa. The trail leads through a stand of juniper trees to an old dilapidated gompa which overlooks on the lake. Buddhist paintings and statues within the temple and chapels are the evidence of the ancient Bonpo religion. We go back over our route to Ringmo and then follow a trail eastwards, through a forest of juniper and blue pine. The trail follows alongside the river up the valley to a waterfall and ultimately to the base of the Baga La Phendi. It's a 3-hour steady climb to the top of the Baga La, the second high pass we then gradual descend for a few whiles and ascend to the foot of the Numa La. Climbing through dry land to Numa La, the final high pass of this trek which is marked by Mani stones and the flutter of the prayer flags from here Dhaulagiri is clearly seen. The trail now descends to a huge mani wall to the Tarap valley and the settlement of Do. Taking a rest in the large settlement of Tarap and has several Gompas itself interesting. Visiting Ri Bhunpa Gompa above the village and Shipchhok with a Bonpo gompa in the east surely worth exploring. You will have opportunities to have great views of the valley and surrounding snow peaks. We start our journey as usual. The trail is almost flat and follows the river until we cross a gorge which has large rose shrubs and other wildflowers, and after crossing the river several times, the trail opens up to a flat area into Lahini. Today's steep, narrow and dangerous trail will be an unforgettable memory for you. Eventually, the valley widens and the route becomes easier as we approach the village of Khanigaon. We will then climb above the river before descending towards the Barbung Khola and into the fortress village of Tarakot. We will follow along with the Barbung Khola downstream along the south bank to the Lawan village, before crossing to the north bank and walking for few more hours to Dunai. Finally, we trek back to Juphal following the river trail downstream. 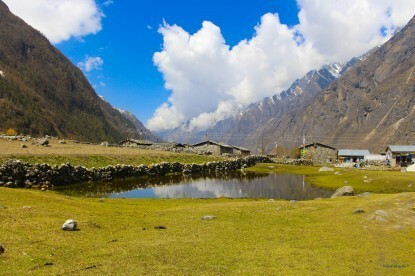 We will also be walking uphill through meadows and past a few houses to the small hotels at Kala Gaura (2090m). We will finally reach Juphal in a few hours walking. This is the ending point of our trek.